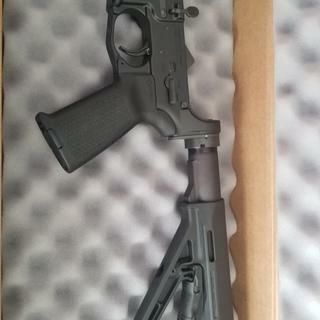 PSA AR-15 Complete Lower Magpul MOE Edition - Black, No Magazine. Lowers may be Safe/Fire or Pictogram. Do you have to register this lower if purchased? BEST ANSWER: That depends what you mean by register. You must have it sent to a FFL and pass a background check. That process is not a registry!! Depending on what state you live in you may have to do additional paperwork to register it with your state. Yes you must register the lower. The lower has the serial number. Can I use this lower for a 300 blackout upper? Thanks! BEST ANSWER: Yeap! 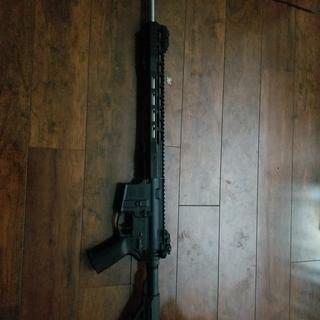 Ive used my lower with my 300 black upper as well as my .223. Depending on you barrel length you may need to change the buffer spring if you have cycle issues but that is alwaus a ponsibility and has no reflection on the PSA lower. Yes, the lower is just the activation of the ballistic. The complete upper is what needs to match the specs of the projectile of choice. You can use the psa lower on a 300 blackout but you may want to get a better firing pin,so the gun cycles the same. It should work fine if your upper is of fairly recent manufacture (last 15 years). Yes no problem at all. This is actually what you need. Yes, a 556 bolt too. Is this for a carbine gas tube? BEST ANSWER: It's a lower. The length of the gas tube doesn't matter when purchasing a lower..
You can use this lower for all the gas systems. You can use either carbine, or mid length. You can use any gas length system with any lower. Is this considered a rifle or pistol lower? It is marked PA-15 Multi. As in multi caliber. It can be used as either a pistol or rifle lower. If you want it to be bulletproof as far as the ATF goes, once you fill out the background check make sure the ffl chooses either pistol or rifle (depending on your build) under section b, number 16. Typically other is checked for lower receivers. In short it’s both a rifle and a pistol lower. This is a completed lower, an upper makes it a rifle. will this make me gun automatic? BEST ANSWER: The lower itself will not. You need the full automatic sear and sear spring and new thumb safety. It also depends on your BCG. Automatic as in fully automatic? Really? yes it will make the gun semi-automatic. what is the weight of this lower? Do you know this complete lower weight?? Is it compatible with 5.56 and .223? BEST ANSWER: Yes this lower is multi-caliber. You can use it with the appropriate upper in .223, 5.56, .223 Wylde, 300 Blackout and other's as long as ammo goes into a standard AR-15 magazine. Your upper's barrel and chamber are what actually determine the caliber of your rifle. 5.56 and .223 cartridges both fit into STANAG style magazines which this lower accepts. The part that the 5.56 and .223 cartridge difference comes into play with is the upper not the lower. 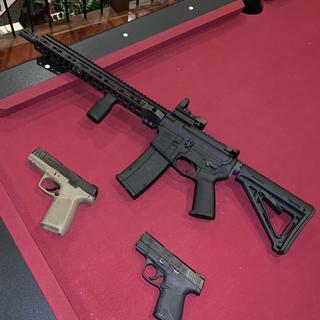 Yes this just being the lower portion of a small or standard size AR. It is compatible with almost all standard size uppers . Yes sir it most definitely is I have the same lower paired with a 223 Wylde barrel. Yes and I have purchased several. They are quality items. PSA is my go to Shop!!! Yes,it is compatible if your upper will handle 5.56 or 223. Yes, it is intended specifically for .223/5.56. Will this lower work with the 6.5 Grendel??? BEST ANSWER: Yes it will 6.5 Grendel is off an ar15 platform and NOT an ar10 platform. Can you put a 7.62x39 upper on one? BEST ANSWER: Yes, I have a 7.62x39 upper that fits nicely on mine. That’s what I did w/ mine! Can you buy a complete lower with out ffl ? BEST ANSWER: No any lower receiver has to go through an FFL. Any upper you buy can be shipped directly to you. No. You may purchase a complete upper without an NFL but not a complete lower or even a partial lower. For these an NFL is required. No. All completed lowers have to be shipped to an FFL. No, the lower must go through sn FFL. Is the buffer tube Milspec, or Commercial Spec? BEST ANSWER: Yes, it is Mil-spec. Verified by my digital caliber measuring at 1.146 of an inch in diameter on the buffer tube. Such a great deal in quality. Yes, it is Mil-spec. Verified by my digital caliber measuring at 1.146 of an inch in diameter on the buffer tube. Such a great deal in quality. When I bought in December the spec sheet said MilSpec. The tube size is mil-spec. Is the castle nut staked? BEST ANSWER: Yes the castle nut is staked. No, it is not. With proper spanner or armorer wrench it comes off quite easy. Is this a high shelf or low shelf receiver? Will this work with .223? BEST ANSWER: Yes AR-15 Lowers are for .223, 5.56 and several other similar calibers. Is it metal or polymer? They are aluminum lowers just like all the rest. BEST ANSWER: This is a great product for someone who does not want build a lower. I have not ran many round through this lower (maybe a 1000) but so far I’ve had no lower related issues. 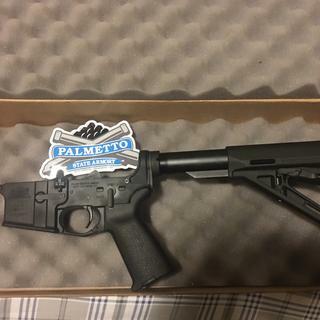 I have bought two complete uppers and lowers from Palmetto. They are well made and I have not had any problems with them. I'm well satisfied with them. This is a great place to start! It’s a great deal, but a great quality lower as well. I got one when I didn’t need one it was so good. I have this one as my first (and only) AR. It’s got 5,000+ rounds through it so far. I’d say it’s gtg. I have several uppers and lowers from PSA. All good stuff! BEST ANSWER: This item is mil spec in dimension and the attached buffer tube. I have purchased several and all have been better than the " cheapest bid" "mil-spec". Does this include buffer & spring? It doesn’t state in the specs but I’m assuming that with PSA’s impeccable quality this is a forged aluminum lower and not poly, correct? Yes indeed it was. Tough as nails. Is this forged or billet? BEST ANSWER: It is Forged. Being Milspec, am I correct that this lower will fit a Milspec uppers from another manufacturers? BEST ANSWER: Yrs it will fit most lowers and uppers r made from like 3 company's and just get different brands engraved on them. Absolutely, as long as the upper is in mil spec. On the moe editions will they accept 9mm or 45 cal magazines.? Pretty sure you need to purchase a lower for 9mm or 45acp. No. This lower only supports 7.62x39mm or 5.56mm/.223 Cal. 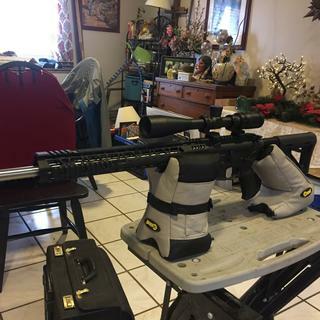 Can put on a .450 Upper ? Yes an ar-15 Bushmaster upper receiver will work with this lower. It can handle a 458 so com upper. Is the enhanced trigger guard made from polymer, or aluminum? Anyone having cycling issues seems like buffer is to light? BEST ANSWER: Married this to a Daniel Defense 300 SBR with 0 issues shooting 150-200gr. So far, no issues with cycling. Good luck and hope you can your cycling issues resolved. I use this LOWER for .277 Wolverine, 6.8 SPC II and .450 Bushmaster with ZERO problems !! 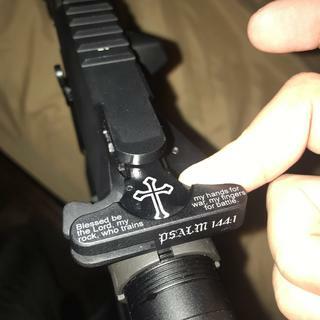 Have not fired this lower yet. Does this have a 2 stage trigger? no.. it is incorporated with a single stage trigger. 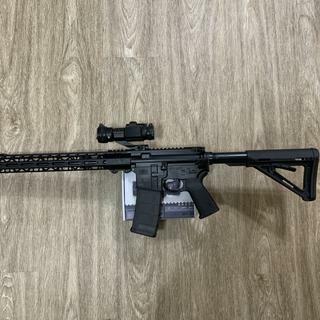 This is my first time building an ar. Do I need anything besides an upper to make it complete, and what uppers can I use with this lower? BEST ANSWER: Too much to list. 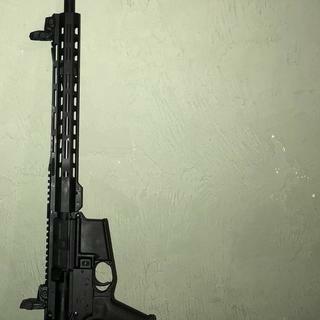 If you get a fully complete upper, including BCG and charging handle can(typically not included, but are sometimes) that will be it. Google standard AR calibers. Long list. For example: 5.56, 223, 223 Wylde, 450 Bushmaster, 458 Socom 6.5 Grendel. First time builder, I would stick with 5.56 or 223 Wylde, ammo is cheapest and it is the most common caliber. 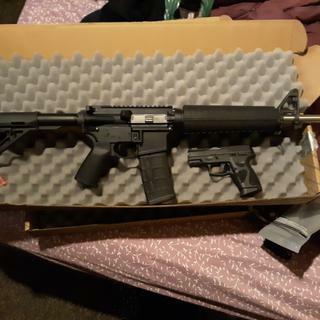 Forgot to mention I have two of these, one with a PSA 5.56 upper and one with a PSA 7.62x39 upper. Both uppers I bought were complete uppers.You need special magazines for the 7.62x39 upper. Just make sure you get the complete upper and complete lower and when they come it takes all of 1 minute or less to put together. Can you use this lower with a 458 upper? 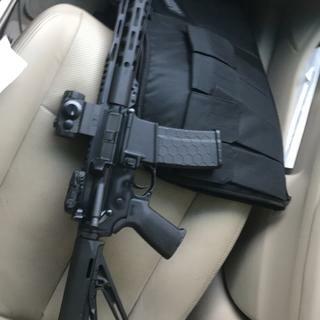 BEST ANSWER: From what I understand of the 458 is that you can use any ar15 lower kit from any company...I don't personally own one but it is what I have heard and seen from alot of links and stuff. Yep, .458 Socom uses a standard AR-15 lower. Is this lower compatible for a .224 valkyrie upper? Great deal and well put together as well always, but PSA's stock triggers continue to be a low point. I love PSA products. Great quality and great value. Perfect. Every part is tight and ready to go. This is the 7th or 8th PSA lower I've owned. They do what there supposed to do...everytime. It's exactly what it says it is. Solid and affordable. No dings or scratches, everything was there and fitment was perfect. 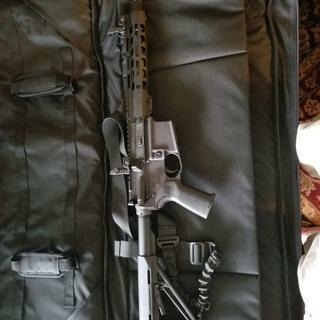 Best AR for the price on the market.this is my 12 AR.All my family is loaded down with AR. Palmetto had my order shipped quickly and the correct item that I ordered. Great product at a great price. PSA GRENDEL UPPER/ PSA magpul lower. Nothing but high fives and thumbs up. Still working on getting tighter groups. Down to 1 MOA at 100yd and about 1.5 at 200yd. Polished the trigger and got a trigger spring kit. Can’t Wait to go back out to try it out. Awesome! Got my upper and lower from PSA and got to shoot about 100 rounds. Feels great in the hand. Trigger is good. Magpul MOE feels great! I am very pleased. I have this paired with a 6.8 spc upper and it is a perfect match. Tack driving sucker. I will order from psa again. 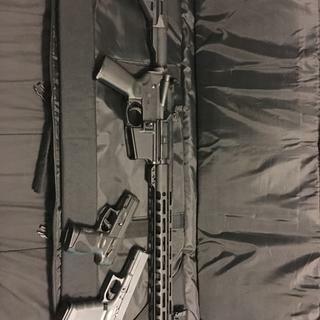 I purchased a pair of these complete lowers and each of them worked fine with every upper have. One front hinge pin did require some "help" from a rubber mallet, but there was no binding at all once it was pinned. These are a good value and saves having to build your own lower from parts. The older I get the lazier I get, and I hate installing the roll pin on the bolt hold-open latch! Working great. Pair with complete upper. Smooth action of fire selection. Trigger is std. Magpul MOE grip and adjustable buttstock are unblemished. Combo with G2C makes it almost free. QUALITY!! Super nice combo deal! 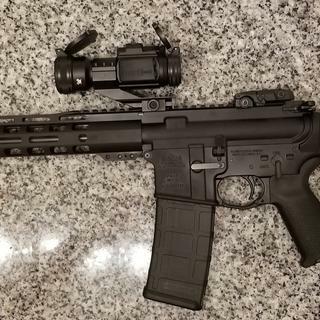 New to the AR world and I chose this lower to start my first build. The quality seems to be very nice and now it’s time to pair it with a PSA upper! 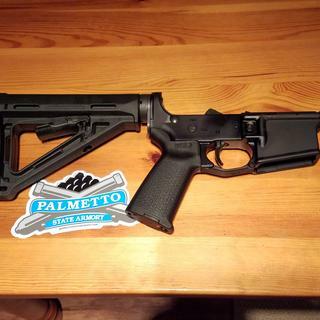 I look forward to many builds to come via Palmetto State Armory! Great mil spec lower for the money! This was a nice lower for the money when purchased as a package with the Taurus G2c 9mm pistol. Very affordable and fair trigger that was easily improved with a little polishing. The magpul furniture is better than standard mil spec handle and stock. I was pleased with the purchase. 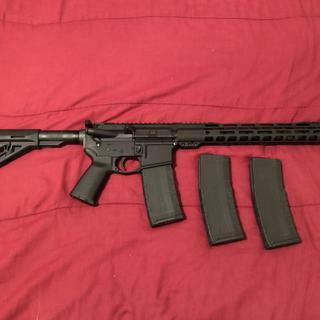 Great deal to pair with my upper, looks good, feels good in hands and a great price. Will definitely shop PSA again! Great product smooth fixtures for combining with a great upper quality material!!! This was my first purchase from PSA, and I wasn't disappointed at all. I've shot a few hundred rounds through this lower that paired perfectly with a PSA 16" assembled upper. The trigger is a bit gritty, but it's mil-spec, and for the price, it's been great. 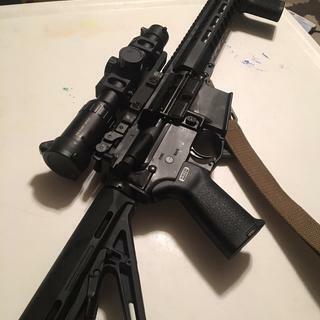 I love being able to save some money on the parts so I can spend more on a quality optic and mount. I love this completed lower! Feels great. I love this completed lower! I can not wait to match it up with a complete PSA upper in the near future. Everything works as it should. The Magpul gear is nice. Mated perfectly with the PSA complete upper. Great buy at a great price. 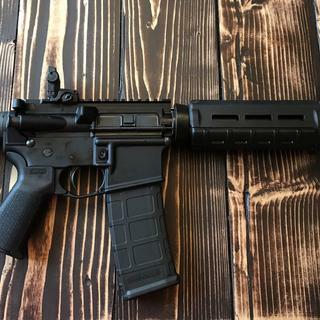 This was a great price for a complete lower.I also bought one of your blem 5.56/223 uppers, and mated them for a real nice AR for around $350.00. I don't know why you sell this upper as a blem, because I could not find anything wrong with it. Your service and speed in mailing is superb. Now, I just have to find timed to shoot. Seems like a nice, correctly built lower. Good deal, glad I purchased this as opposed to putting one together. Nice fit to the upper (PSA) that it was purchased for, no noticeable slop. Take down pins are a little tight but expect them to get easier with more use. Trigger pull is heavy as expected, but pleasantly surprised of no gritty feel like usually is common. I purchased a Hogue grip for it but actually found this one decent enough to keep as is. Great finish and fit. Would purchase again. buffer tube was inserted about 1/8 inch to far making it impossible to seat upper to lower. An obvious error, undetected by psa qa. Shipping label for rma issued. Waiting for it to come back fixed. Above average for the price, quality exceeds price point. Purchased this to replace an older unit I put together from parts purchased 10 years ago from another vender. Everything about this unit is superior to the old one. Quality finish, much better stock, and a smooth crisp trigger. Bonus, it was part of a package deal which included a Taurus G2C pistol. I wasn't really sure about the pistol until I got it in my hand. I have large hands but it still felt good in my hand, and had the best trigger I've personally encountered with a striker fire pistol. I'm normally a metal hammer fired gun guy but this is a nice compact 9mm with 12 round mag. I'm happy. More than what i was expecting. Excellent quaility product. This lower works very well with the upper I purchased previously. The upper is 18 inch stainless 223 wild, matches the lower perfectly. this is by far the best way to building a good quality lower on the cheap, specially if you are pushed for time. Functions perfectly. 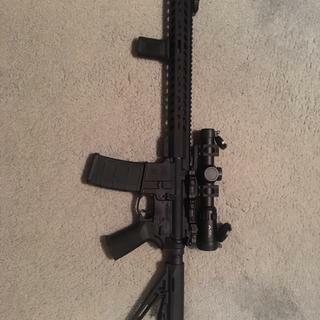 Would recommend to anyone building an ar-15. 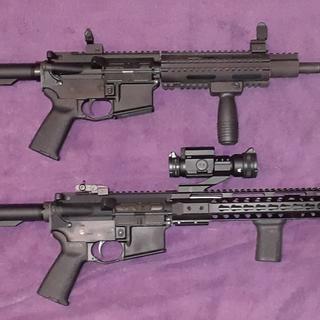 223 or 556. What is there to say, works just as well as any of the others I own at a fraction of the cost! Exactly as advertised and fast shipping. Quality as I’ve come to expect! PSA has the best stuff ,never a problem ! Works the first time !!! 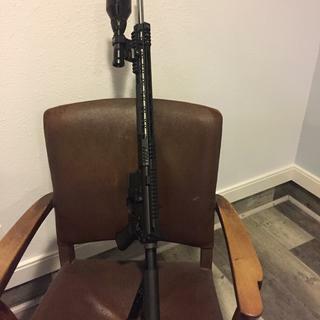 fit perfectly on my PSA upper. It makes for a very nice set-up! Great Lower for the Price! Lower was shipped very quickly and received in great condition. Great lower for the price and functions properly!